Capacities from 300 to 8,000 pounds. TH - Straight-sided, heavier duty and molded from the standard compound. TL - These laminated tread wheels have continuously wound tread with a macerated center. Highly resistant to chipping or fraying. Resistance to shock or impact is approximately 35% greater than macerated tread wheels. 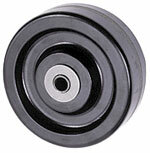 TM - Standard phenolic wheel. Seals - All wheels that have 1-3/16" bore and either a 1-5/8" or 2-3/16" hub length equipped with 3/4" straight roller bearings have as a standard feature nylon seal retaining/thrust washers which add 3/16" to hub length and are supplied with 1/2" ID hardened spanner. Sanitary wheels furnished with straight roller bearings come complete with rubber lipped metal washer seals. Lubrication - All wheels with 1-5/8" and 2-3/16" hub lengths are lubricated through a hollow axle but can be fitted with zerk fittings where specified. Temperature Range - Continuous operating temperatures from -65ƒF to +250ƒF and intermittent duty to +300ƒF.